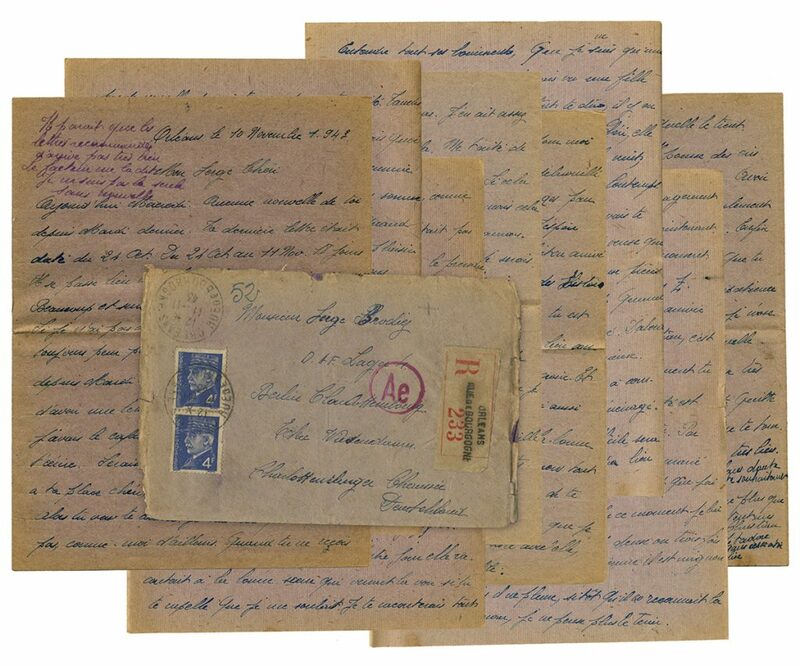 Carolyn Porter | November 10, 1943: "I’m still afraid for you"
See/read a letter mailed from France to a barrack in Berlin during the middle of World War II. This is the first letter I’ve found that was mailed from France to a French laborer in Germany. The letter was addressed to Serge Brodig, who was in a lager (a barrack) in Berlin. The postage stamps bear Petain’s profile. I was eager to have this letter translated because I hoped it would provide insight into life “back home.” At first, the content (a cheese slap!) seemed funny, and the translator and I chuckled. But, as the translation came together, we both began to feel sorry for Elise, the young wife and mother who wrote this letter. [Note at the top left in lighter ink] It seems that letters recently are not arriving very well. The mailman told me this. I’m not the only one without news. Today it’s Wednesday. No news from you since last Tuesday. Your last letter was dated October 24. Between October 24 to November 11 there were 18 days. A lot of things are happening. I’m starting to get the blues and especially I worry. Tomorrow, Thursday, if I don’t get any letter, what am I going to think? I’m still afraid for you. I haven’t written to you since last Tuesday, and I was still waiting to get a letter. I’m still very busy. I had the blues, I didn’t feel up to writing to you. It may be the same for you. I would like to put myself in your place, darling. You must be very tired in the evening. So you go to bed. I know that you haven’t forgotten me, and it’s the same for me. When you don’t receive any news from me, please don’t worry. As for me, it’s not the same. I don’t know what to think. I imagine all sorts of things, I worry. Sunday November 7 marked one year that we have been married. I will show you something when you return. I hope that it will please you a lot. The time passes; soon it will be five months that we have been separated. If only you could come home on leave. Try to work that out. Right now things aren’t going well. My darling little Serge, please don’t worry about what I am going to tell you. I’m going to say it bluntly because that’s how it must be. This afternoon I argued again with your grandmother. She accused me of having opened a letter addressed to her. You know well that I would never do such things. She was supposed to receive a half of a cheese, but since she couldn’t have it because she wasn’t enrolled, I asked her for her card to get it at the [unclear]. So I had her half of the cheese and when I took and gave back her card, she accused me of stealing her cheese ration tickets. I showed her my card and hers, to prove to her that I hadn’t done anything wrong. She insisted strongly that I had stolen her tickets. She also accused me of having used some [unclear] that I used, said that she didn’t want to see me anymore and she kicked me out the door. I was so angry that I slapped her. To listen to such things! The other day she was telling the nun who came to see her if you recall that I used to get drunk. I will tell you all that in detail when you come back. I’ve had enough of listening to things like that. Calling me a thief and a liar, and saying that I drink! If that continues, I will not have a good reputation, but that will not continue because I’m going home to Mom, in the room on the third floor. I will be calm there. Tomorrow morning I’m going to get a small room heater. I will have all my things. [Name unclear] is going to lend me [her/his] little kitchen cabinet. I’m going to fix it all up, it will be very clean, I think that I’ll like it there. I’m going to buy what I can. I’m not leaving anything behind, you don’t have to worry. All your tools, your workshop, your books, everything, Don’t fear, I won’t forget anything. I’m going to work it out the best that I can. Above all, darling, don’t worry about me. I’m OK financially, I can manage. We are going to try to make the Georges [Translator’s note: a neighbor family?] leave so that I can take their place [Translator’s note: apartment?]. I hope that everything will work out well. It has to work out. Since the time that she looked for me without silence. Remember, darling, when you left I told you: you know that she must be very happy that you are leaving, you didn’t want a friend. Well, now you have the proof, and me, too, besides, after what she told the nun. I will tell you all that when we are together. Darling, please don’t be angry toward me for causing such trouble. You know that I love you, that I have done everything to stay with her [but] really it’s not possible. To hear all her…, that I’m a spendthrift, that she had never seen a girl like me. I can’t tell you everything; it would take a book. Well, my darling Serge, she finally finished. She doesn’t sleep at night. She should…. All that for a very long time. I hope that you will not be too upset. I’m going to prepare a nice little apartment. I want you to be very happy when you return. There are two rooms. It’s not very big but until the war is over it will be fine. First, when we’re together things will be much better. Today wasn’t very pleasant. Mom and I started to move. The trailer is very useful. The hardest part will be the bed and the… but everything will work out in the end. Tomorrow I’ll continue moving. It won’t take long now. I heard planes for a short time. There was a drill. It’s around 11:00PM. It’s been a long time since that happened at night. It’s surprising that it didn’t awake Christian. I hope that you are now sleeping calmly. Is your health good and [I hope that] work is not too hard. Sometimes I wonder if I am really married to have [unclear]. Fortunately I have my Christian, otherwise… I’m teaching him to say ‘Papa.’ He has said it two or three times and he hasn’t said it again. If only you could see how cute he is! He hardly ever cries. When he hears Mom’s voice, I can’t hold him any more. Good night, darling. Your little wife, who loves you more than anything in the world. I send you all my tender kisses as well as from Christian. – Élise did not separate her letter into paragraphs, but I have done so for clarity. I have also added some punctuation to make run-on sentences more clear. Her handwriting shows some very beautiful letters, such as capital E of the first word on page 3; and ‘capital I, lower case L’ on the second line of page 7. Les lettres n’arrive pas ‘Letters are not arriving.’ Correct spelling: Les lettres n’arrivent pas. A plural subject (les lettres) requires a verb with a corresponding plural ending (arriving). Both verbs sound the same but should be spelled differently. Tu doit…. ‘You must…’ Correct spelling: Tu dois. With the subject tu (you singular or familiar) the verb always end in. Since both final ‘t’ and final ‘s’ are silent, both verb forms sound the same but should be spelled differently. This was a common pattern in this letter, as in j’était instead of j’étais (I was). Que vais-je pensé? ‘What am I going to think?’ Correct spelling: Que vais-je penser? This is the other common pattern in this letter. The verb forms pensé [‘thought’ as in j’ai pensé = I have thoughtI] and penser [to think] are both pronounced the same so it’s easy to see why Élise did not distinguish between them in writing. The writer is expressing her emotions and may not have been a great student of spelling and verb conjugations. Je lui est donné une giffle. ‘I gave her a slap.’ Correct spelling: Je lui ai donné une gifle. Again, the pronunciation of est and ai is the same but only ai is correct here, and both giffle and gifle sound the same. This is a personal letter, not a school essay, and Élise has a lot to tell her husband at an intensely stressful time.